I have been a fan of Elaine’s books since I picked up the first book in the Woolworths series called ‘The Woolworths Girls’, which was released in May 2016. I very patiently, oh ok make that impatiently wait for each new book in the series to be released. 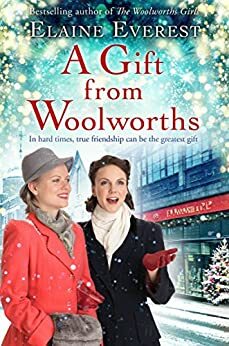 The latest book in the series is called ‘A Gift From Woolworths’ and it is due for release on the 1st November 2018. Wowzers, it’s one heck of a fabulous read and I adored it but more about that in a bit. Whenever I pick up a new book in the Woolworths series, I really do feel as though I am reuniting with old friends. It doesn’t take me long at all to feel as though I am one of the gang. It seems unfair to single out any character for further analysis but on this occasion I have to say that I really, really felt for the character of Sarah at the beginning of the book. Bless her, she is still mourning the loss of her mother, who was killed by a V2 rocket in another branch of Woolworths. Not only has Sarah had to deal with that but she has also had to deal with the fact that her husband is away serving in the Royal Air Force and naturally she worries about him. If that isn’t enough the beginning of the book sees her experiencing a difficult labour with her second child. Talk about piling stress upon stress upon stress. Sarah’s first child was born after a fairly quick labour and Sarah is worrying about the possibility of her second child dying before it has even had a chance at life. There were several occasions where I just wanted to jump inside the pages of the book to give her a huge hug. Thankfully Sarah has many friends and beloved family members around her and they step up to the mark for her. The ‘Woolworths Girls’ series appeals to me in a few different ways. Firstly I absolutely adore family sagas, even if I do end up in a fight with a pensioner. Let me explain – Mrs. Ginger Book Geek is a huge fan of sagas too and if she finds a series that she likes, she mugs me for the chance to read each new book in the series before I do. These OAPs can be pretty vicious. I end up losing every time but anything to keep the peace. Lol. Secondly my late father worked for Woolworths, when he was a teenager and he often used to tell me stories about when he worked there, so to read the ‘Woolworths Girls’ series reminds me of him. Thirdly, I miss the Woolworths shop that we had in our local town and I often feel nostalgic for it- or more specifically for the Pick & Mix department. As I mentioned above, ‘A Gift From Woolworths’ is a seriously good read. I was literally hooked from the first word on the first page and I absorbed myself into the story. The characters and the storylines seemed very realistic indeed. At the beginning of the book, I was all for jumping inside the pages of the book to kick a certain character down the stairs after the arrogant way in which he treated one of the ‘Woolworths Girls’ or not as the case was. I was all for booting him out on his ear. I then had to remind myself that the book is fiction even though it seemed ‘real’ to me. Reading ‘A Gift From Woolworths’ became exceedingly addictive. I would pick the book up only intending to read a couple of chapters but that intention soon went out of the window because I was enjoying the book that much that I just couldn’t put it down. ‘A Gift From Woolworths’ wasn’t exactly glued to my hand but it might as well have been because it came everywhere with me. I couldn’t bear to be parted from the book and if I had to put the book down, then I was counting the time down until the time I could pick it back up again. I begrudged having to take my two Labradors out, which didn’t go down well and they tried all ways to disrupt my concentration. Reading ‘A Gift From Woolworths’ really did take me through a wealth of emotions from happiness to sadness, joy to despair and well you get the picture. I felt as though I had been on an emotional rollercoaster ride by the time I closed the back cover of the book. In short, I absolutely ADORED reading this latest instalment of the ‘Woolworths Girls’ series and I would definitely recommend it to other readers. This is the fourth book in the series but it can easily be read as a standalone. I can guarantee that you will enjoy reading this book so much that you will have to read the other three in the series. ‘A Gift From Woolworths’ is sure to be a huge hit and will certainly be appearing on the bestseller lists. The score on the Ginger Book Geek boar dis a very well deserved 5* out of 5*.